WHAT I SMELL: Mohur Extrait opens with this deep and dreamy lightly peppered and spice haze. The notes dance and swirl in an incredible kinetic motion, but in the most mysterious way. It’s as the perfume want to make itself hidden until it decides it’s time to reveal its true self. In other words, the perfume is incredibly quiet in its opening and it’s impossible to pick out individual notes. The dancing notes bring forward ambered floral and exotic spices all the while remaining dreamy and enticing you with subtle whisps of temptation. The warm florals mixed with the subtle spices are as intoxicating as I have ever experienced. After some time, the mysteriously quiet kinetics begin to open. But this box of jewels will not open quickly; a case of jewels might blind one if opened without care. After some more time, a light creaminess is added to the mix of the spiced florals. And soon enough, a lovely spiced rose quietly moves to the center of the mix. It’s creamy, warm and dreamily enrapturing. In the end, Mohur Extrait wraps you in this warm embrace of lightly powdered radiating spiced rose wrapped up in the most exquisite sandalwood. How come the perfumes that I love so much are so hard to describe? Maybe it’s because their beauty defies words. Mohur Extrait Notes: Cardamom, coriander, ambrette, carrot seeds, pepper, elemi, iris, jasmine, rose, violet, almond, leather, sandalwood, amber, woody notes, patchouli, agarwood (oud), benzoin, vanilla, and tonka bean. 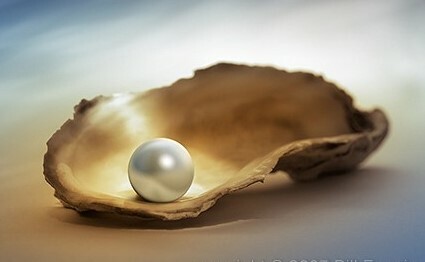 WHAT IT SMELLS LIKE TO ME: The loveliest pearl; majestic, luminescent and a beauty to behold. BOTTOM LINE: The original Mohur Eau de Parfum is incredible; but this limited edition Mohur Extrait is utterly divine and a testament to the incredible art of creating a great perfume. Neela and Bertrand once again have created magic. If only this came in a smaller size so more people could experience it. Sample courtesy of Neela Vermeire Creations. Categories: Neela Vermeire Creations | Tags: 5 bones, floral, fragrance, Mohur Extrait, Neela Vermeire Creations, parfum, Perfume, Perfume Review, review | Permalink. So freaking good. My absolute favourite from the line. How lucky are we to have NVC in the world Steve? I like Mohur but I’m more of a Trayee girl. I’m thinking that’s a good thing because this one is priced way out of my comfort zone. I’m sure it’s wonderful. Everything she’s released has been pretty amazing. At least what I’ve smelled has been. I know…all these beauties. I need to win the lottery! That should be VERY, not bery. Where is spell check when you need it? Mohur is Magic in a bottle. I know, so many good to choose from… it’s still my favorite and of course it’s the most expensive. Hmmm, I think I have a lottery ticket that I haven’t checked yet….ah heck!